A whole lot of deep and meaningful subtext going on in CW’s DC TV shows, huh? Like a few of the Supergirl episodes from this season, The Flash asks questions about heroes, villains, and what makes a person one instead of the other. Is it intention? Is it a lack of damage done? Is it something inside of people that makes them good or evil, that causes them to turn selfish when they’re handed great powers? Supergirl explored its ideas within the context of humans and aliens, while The Flash deals in humans, metahumans, and how both power and powerlessness can make people do terrible things. The monster at the end of this episode is a hologram. Was that a purposeful metaphor for our perception of good and evil — the idea that nothing is as black and white as we all wish they could be? Monsters don’t always exist the way we think they do. Sometimes they’re actually just a bullied high school kid with too much technical equipment and a lot of rage, I guess? I’m probably giving the show way too much credit for thinking that deeply, but hey — I gotta talk about something in these reviews, or else it’d just be 1,200 words discussing how great the idea of Barry and Cisco as roommates is. Barry makes Cisco breakfast, you guys! But Cisco’s kinda grumpy about it, apparently! Ha. Wonderful. There’s a monster in Central City! Like, a legit monster — not a King Shark or a super intelligent gorilla, but an actual, vaguely Godzilla-esque monster that’s wreaking havoc and terrorizing the populace. This is a first for Team Flash! They’ve never dealt with actual monsters before — just, you know, human beings turned into superhuman monsters because of particle accelerator explosions and the apparent causal relationship between the acquisition of power and the desire to do evil. A monster is new and interesting! We even get some dialogue hints at it, thanks to Barry’s interactions with Julian Albert. In one scene, Julian tattles on Barry’s questionable behavior regarding private case files, and Barry gets this speech from their boss: "You do good work here, Allen. Don't put that in jeopardy by thinking the rules don't apply to you." If that’s not a subtle dig at Barry fiddling with the timeline, then it’s just an absolute waste of a subtle dig at Barry fiddling with the timeline. Julian is critical for the themes in “Monster,” actually. His hatred for metahumans stems from his resentment of how they use their powers for evil instead of good. He thinks that, if he were gifted with such abilities, he would do great things for the good of mankind or whatever. I think he kinda just glosses over the fact that heroes like the Flash exist, but yeah — his reasoning is sound. It really is bizarre that all these people get powers and immediately turn toward selfishness and superiority. Oh, but how Julian snarks too soon! For it is he who nearly makes a terrible mistake born of selfishness and superiority, when he confronts the perpetrator of the holo-monster and nearly shoots a teenager. Because Julian thought he knew best, and it was only by the luck and superspeed of the Flash that he doesn’t make that mistake. The thin line between good and evil, my friends! Meanwhile, back at S.T.A.R Labs, H.R. “Pufnstuf” Wells has been busy doing what I used to do back when I zoned out in class and the teacher called on me to answer a question — i.e., he’s spinning a load of nonsense around the last word he heard clearly and hoping everyone else is too confused to notice. Hey, don’t knock it. That technique got me an A in Sociology class and it seems to have scored ol’ H.R. a sweet gig fighting monsters with a team of superheroes. H.R. is a liar (that seems to be a trait that exists across the board for Harrison Wellses) but is he evil? As far as this episode goes, he appears to just be an affable sorta-idiot whose strengths lie in weaving such vast webs of balderdash that, by the laws of probability, people are able find something of value amongst the gibberish. There could be a point somewhere in the future where an actually intelligent Harrison Wells might save some life or another. Does the presence of H.R., taking up a space on the team based in lies and prattle, in the place of a more useful Wells make his existence sorta evil? Oh, wait. I’m pretty sure he really is a novelist. Yeah, all novelists are evil. Never trust a novelist, kids. And finally, we have Caitlin Snow and her developing powers. All throughout the episode, and ever since we found out that Caitlin had Killer Frost powers, I’ve wondered why she wouldn’t just tell her friends about it. I suppose her reasoning is also connected with this episode’s themes on evil and power. Basically, Caitlin is probably terrified that her metahuman abilities will push her into the realm of evil that her Earth-2 counterpart had lived in. The fact that Caitlin’s mother is an absolute witch probably doesn’t help, though, and neither should the tension Caitlin is forcing on herself by keeping the powers a secret from the people who care about her. 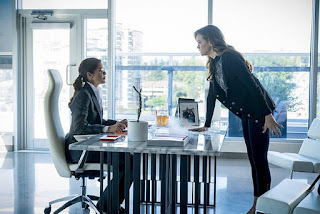 So yeah, while I do get the point that the show is trying to make with Caitlin and the oncoming evil power, I still can’t believe she’d go to her evil mother for help before utilizing the metahuman experts at S.T.A.R Labs. Especially since whatever her mom’s doing isn’t working, what with her freak-out at the end of the episode. Yikes. “How do you say ‘see you later’ over there?” “‘Until next communion!’” H.R.’s Earth sounds overly formal. "Last time I checked you didn't need super speed and a red suit to help people." I love you a lot, Iris. "Murder on the Titanic! Who did it? Who cares — we're all drowning." This new Wells is useless but so entertaining. Caitlin’s mom is the worst. I pronounce it “Ay-Tee, Ay-Tee” but okay, The Flash. And a bunch of other nerds. Do what you want. They just cribbed Draco Malfoy’s bio for Julian’s life story and personality, right? And added in some love of science? Anyway, Julian’s kind of growing on me. Moral crises look good on him. Tones down the smarminess a bit. All I want is for Julian to get a hair cut and go do karaoke with Barry and Caitlin. Totally noticed that they basically gave the most unsubtle nod to Draco Malfoy ever (My facebook status after watching: "Julian Albert = Draco Malfoy in disguise? 🤔"). While new Wells is a bit annoying, The Murder on the Titanic thing was great, so was him saying that Gladiator on his earth was named "Sweaty Men".